It's a lot of tile, but I love it. AMERICAN SNIPER. After the elegant train wreck of J. Edgar (2011) and the incomprehensible Jersey Boys (2014), some of us harbored concerns about Clint Eastwood's directorial career. The former succeeded aesthetically but crashed narratively. The latter made no sense at all. It might have signaled the desperate, flailing end of a storied career. But then Eastwood directed American Sniper and, by all indications, is reborn. One might attribute this success to the macho flag-wavery of the subject, but the movie is too good to be dismissed. The patriotism described is simplistic, but the craft and nuance make it exciting and involving. At 30, middling Texas cowboy Chris Kyle (Bradley Cooper), motivated by the terrorist attacks leading up to and including Sept. 11, 2001, enlists. His strength, toughness and aptitude behind a rifle find him a place in the SEALs and in short order he's deployed on the first of four tours of duty in Iraq. Kyle's preternatural sniper skills earn him the moniker Legend, but while the death dealing never shakes his commitment to protect his fellow soldiers, the reality of it — like finding armed children in his cross-hairs — erodes his emotional wellbeing. When he rotates home, it's almost impossible to transition and reconnect with his wife, Taya (Sienna Miller), and their growing family. He's attuned to the combat zone, explosions and post-traumatic stress still ringing in his ears. 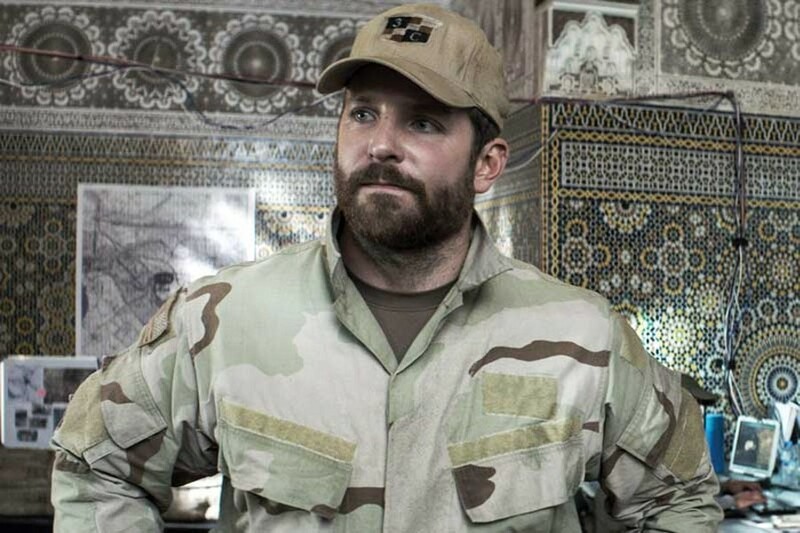 Unfortunately, American Sniper streamlines Kyle's post-military transition back to civilian life. Throughout the movie, his struggles and crises are painfully real (due mostly to Cooper's much talked-about immersion in the character), but by the end we are to believe that he's moved on, somehow. Compared to the movie's successes, though, this is a pretty minor gripe. Eastwood gives cinematic life to a true war story, crafting breathlessly exciting action sequences and scenes of quiet domestic devastation in equal measure. This is a War Movie, certainly, but grounded in war's intimate personal cost. R. 132m. BLACKHAT. The release of a new Michael Mann movie is always something to look forward to. Though the no-confidence release date assigned to this one seems counter-indicative. He has made a career creating stylish, ridiculously detailed — check out the commentary on his less dense Collateral (2004) — cacophonous action cinema. (I've strained not only my wife's and neighbors' patience but the wherewithal of my speakers with late-night, high-volume montages of Mann's combat sequences.) While Blackhat may not reach the heights of his top-tier stuff like Heat (1995) or Miami Vice (2006) — hey, I like what I like — it's still miles ahead of most contemporary action thrillers. After a nefarious hacker precipitates a meltdown at a Chinese nuclear plant, then tampers with the futures market, investigator Chen Dawai (Leehom Wang) is assigned as liaison to the U.S. Department of Justice. He parses the code used in the attacks, recognizing in it lines he and his MIT roommate wrote years before. Said roommate, Nick Hathaway (Chris Hemsworth), now resides in a penitentiary on a 15-year sentence. Chen negotiates a furlough so they can chase the bad guy from Hong Kong to Indonesia to Malaysia. Blackhat is a little long, the second-act love story feels forced and Hathaway's evolution into the ultimate badass is somewhat questionable. But the narrative is still compelling, the violence is exquisitely shot and the technical details seem, at least to this Luddite, pretty authentic. R. 135m. FOXCATCHER. Director Bennett Miller (Capote, Moneyball) makes carefully composed, thoughtful, novelistic character studies. He doesn't throw his camera around or use music or cutting to sell the audience. His approach is deceptively simple, and all the more difficult to pull off. He creates elaborately detailed worlds, peoples them with painstakingly developed characters, and then allows the events of a story to play out with the appearance of effortlessness. It's reinventing the reality of real life, often to devastating effect. After winning a gold medal for wrestling at the 1984 Olympics, Mark Schultz (Channing Tatum) is in a rut. Broke, unrecognized, thanklessly training for the world championships, he's a round-jawed embodiment of unhappiness. A shot, not five minutes in, of him eating a roast-beef sandwich in his car is one of the saddest images in cinema this year. His older brother Dave (Mark Ruffalo), also a gold medalist, is the more confident, likeable brother. Seemingly at random, Mark gets a call from representatives of John E. DuPont (Steve Carell), chemical magnate and passionate wrestling fan. He invites Mark to move to his Foxcatcher estate, where he has constructed a state of the art training facility. It seems too good to be true, which, of course, it turns out to be, but Mark jumps at the chance, eventually bringing Dave along, too. There is something to be said here about wrestling as elemental human competition, about the scion of war profiteers corrupting it to his own childish ends in this true story. Foxcatcher is a quiet, atmospheric, slow-moving tragedy — also an acting master class. Tatum's impressive work is not to be dismissed, but Carell and especially Ruffalo disappear into their roles so fully it's shocking. R. 129m. A MOST VIOLENT YEAR. Jessica Chastain, Oscar Isaac and David Oyelowo in an '80s organized crime drama. R. 125m. STRANGE MAGIC. This animated fairy-fest is "inspired" by A Midsummer Night's Dream. Voiced by Evan Rachel Wood and Elijah Kelley. R. 135m. WHIPLASH. J.K. Simmons makes Tiger Mom look like a pussycat in this drama about an ultra-demanding teacher and a drumming prodigy. R. 107m. THE BOY NEXT DOOR. Jennifer Lopez as a mother whose tryst with a teen goes Fatal Attraction. Seriously, JLo, do you not know a Lifetime movie trap when you see one? R. 107m. THE HOBBIT: THE BATTLE OF THE FIVE ARMIES. Peter Jackson wrings the last drops from Tolkien with exhausting battles and less zip than the previous installment. PG13. 144m. INHERENT VICE. Based on Thomas Pynchon's novel, it's a sublime, hilarious, sad, rambling SoCal druggie detective story for the ages. Starring mutton-chopped Joaquin Phoenix. R. 148m. INTO THE WOODS. As soon as the singing starts, interest wanes and even the strong cast bores in the fairytale mash-up. PG. 124m. SELMA. David Oyelowo is a fine MLK, but the director pulls punches on violence and realistic bigotry, diminishing the impact of this biopic. PG13. 128m. UNBROKEN. Angelina Jolie directs this biopic about Olympiad and World War II POW Louis Zamperini's survival. PG13. 137m. WEDDING RINGER. A matrimonial buddy movie with Kevin Hart as a best-man-for-hire suiting up for the wedding of an awkward dude (Josh Gad). R. 101m. WILD. As author Cheryl Strayed, Reese Witherspoon narrowly escapes Eat, Pray, Hike territory to honestly explore self-reliance, love and loss on the Pacific Crest Trail. R. 115m.